This topic contains 183 replies, has 33 voices, and was last updated by xantari 2 years, 2 months ago. I’ve spent a fair amount of time playing a real Monster Bash years ago and countless more hours playing it on my iPad via PBA… I think this version is looking really great and I am sure will find a home in my regular rotation once I get the new cabinet put together. I will need to play some more as I’d like to check out how you are handling the phantom flip, the kickout is not putting the ball on my left flipper like I’m expecting it to, rather it is hammering it right into the left sling… maybe I’m just used to PBA delivering it to the left flipper and the real MB didn’t but I miss it. A couple weird things I have to assume are due to my inexperience, but I can’t find the DMD anywhere… it is playing fine, but I can’t see the DMD screen anywhere, when I test the ROM in VPinMAME it shows up, just not showing up in game… as well, no flipper sounds… anyway, sorry for what is likely not very helpful feedback… but I enjoyed the WIP. anyone willing to try it? Hi, I play on a cab. In addition to changing VPinMAME.controller to B2S.Server, I have to change line 15 to VarHidden=0 or else the DMD is hidden. 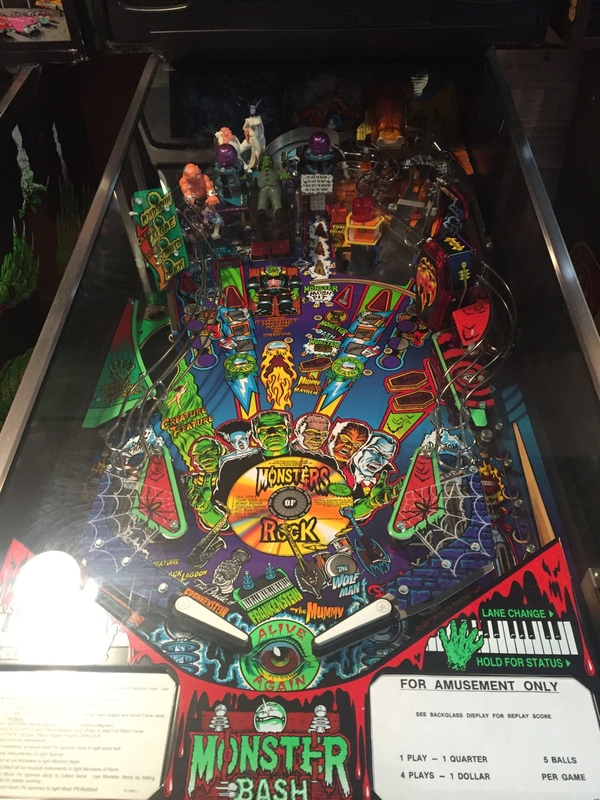 Love the collision effects on primitives, especially Drac and Frank (during multiball). Somebody suggested a long time ago having Frank’s arms swing when getting struck and that effect is implemented well here. JP’s AFM release shows a collision effect with the saucer target bank is hit (it actually might be even a little excessive but it’s been a very long time since I’ve played the real deal so what do I know). Still it might be nice to see a collision effect on the Frank target bank. Thanks for the tip on the DMD! Mine is now displaying. Hi randr and everyone! Sorry I haven’t beta test this wip :( my cab is in his final stretch and is in the wiring phase. Cab is all gutted and can’t play any of the new or wip releases until I finish this mess. On my system ball stutter starts by reducing fps to 30 because the processor reduces speed from 3,2 GHz to 1,6 GHz while playing! Maybe you can watch this, too! I haven’t found a solution for this, maybe VPX is causing this? Table and flippers physics settings are nice but the flippers positions are not optimal. I think the angle should be 123 and 71. Maybe the length is also too long, just check on your real machine if the flippers are that long, otherwise 118 to 120 would be better. Really enjoying this table. Will surely be great when finished. Thanks for the FS settings Clark I think they look good. A couple things I have noticed. Plunge almost always goes to first lane. Drac does not mesmerize me with his semi-circular movement; he just goes back in to his coffin. I had the ball go backwards down the right ramp after hitting it under Frank (instead of normal path it takes it went back and to the right and down the metal ramp not the wire ramp). This probably had to do with crazy ball spin pulling it the other direction. Table plays good for me with reflections enabled and with either no vsync or vsync set to 120. If I set vsync to 1 and play without the dmd showing I don’t think my fps ever dropped below 60 and played great. As soon as I played with dmd showing is when I get fps dropping randomly to 30. I think that is accurate. Remember feedback helps! I know this is not normal to publicly release wips but hey it motivates me so keep trying them guys! I dont know, Physics were prev. a bit better i think. Ball dont lock at right Ramp, when all Franky Parts done … (like VP9 do). B2S = false/true ‘ok dont work, as you know. Flippers should be a bit stronger, its hard to roll through left ramp. I still think flipper positions are better with 123/71 as with the current settings it’s possible to stop the ball when it’s rolling down the inlanes – which is not possible on a real pinball machine. The left primitive plastic is not shown correctly, I have a lot of horizontal fine black lines un it. And is there a reason why you lowered the playfield again? It was a really nice effect to see the ball actually fall down a hole in the old version. Now it’s flat and the effect gone. @clarkkent Playfield hight has no effect on the ball or falling into a hole. Basically it’s useless in VPX. If a wall is used to raise the pf then you won’t have reflections on the table as its not possible with a wall. I’m sure @randr will get some good results using a kicker for a realistic fall though effect. ok. everything plastic is now a model. Wow did that take some time! I also modded some inserts in playfield so they look much better now, mainly drack inserts and frank inserts. Again most people probably wouldnt even know plastics are all primitives but i think it looks nicer then a ramp or wall with new vp10 lighting. randr – Getting better with every WIP. I thought Not sure about this one, but I thought I could change the lit phantom flip inlane via flipper, maybe that is a rom setting, I should check there. Changed a few inserts to better images. all plastics are primitives now.